A papal name is a special name (regnal name) which is chosen by the pope when he is elected. In the early church, popes were known by their ordinary names, such as Pope Adeodatus, Pope Formosus and Pope Hyginus. 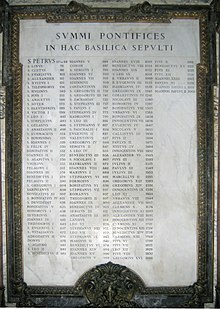 The practice of choosing a papal name started in the sixth century. At birth, Pope John II was named after the Roman god Mercury. When he was elected pope, he chose to be called by a Christian name. Papal names became customary in the 10th century. In 996, the first German pope was chosen; and he changed his name from Bruno to Gregory. He is known as Pope Gregory V.
Every pope since the 16th century is known by a different name than the one he was given at birth. The papal names have included John (23 times), Gregory (16), Clement (14), Innocent (13), Leo (13) and Pius (12). The first papal name to be repeated was Pope Sixtus. There have been four others. As with kings and emperors, a Roman numeral is added if the Pope chooses a name that another pope has used before -- for example, Pope John Paul II decided to be known by the same name as the pope who came before him. 8. Stephen 10 I · II · III · IV · V · VI · VII · VIII · IX · X Pope Stephen II died in 752 after election but before being consecrated. The next pope took the same name in 752; and he is known as either Stephen II or III. * Boniface VII = antipope. 34. Marinus 2 I · II * Marinus I ≠ "Martin[us] II"
* Marinus II ≠ "Martin[us] III"
↑ 1.0 1.1 1.2 1.3 MSNBC.com, "What’s in a pope’s name?" April 19, 2005; retrieved 2012-8-28. ↑ 2.0 2.1 "List of Popes," Catholic Encyclopedia (2009); retrieved 2013-3-16. ↑ 3.0 3.1 3.2 "How Pope gets named," Sydney Morning Herald (Australia). April 4, 2005; retrieved 2012-8-28. Pope tells why he chose the name of "Benedict XVI"
This page was last changed on 31 March 2013, at 15:15.